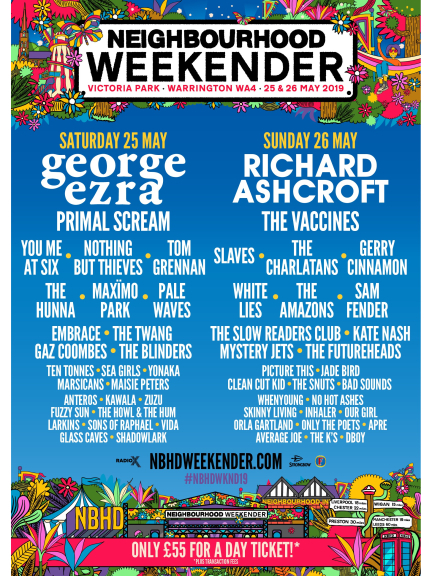 Neighbourhood Weekender has just announced its second wave of artists, including the first festival appearance in 6 years from indie-heroes The Futureheads, White Lies following their brand-new album ‘Five’, and Birmingham legends The Twang. After it’s spectacular 2018 debut, hyped in Louder Than War as “everything you could wish for”, Neighbourhood Weekender returns with another stellar line-up, including British legends Richard Ashcroft and Primal Scream, plus plenty more festivities across the weekend. With the recent sunshine reminding us that festival season’s around the corner, Neighbourhood Weekender sets out to kick off your summer 2019 with a bank holiday weekend full of music, arts, food and fun. The second wave artists join further celebrated live acts such as Best British Male BRIT winner George Ezra, The Vaccines, The Charlatans, You Me At Six, Nothing But Thieves, Slaves, The Amazons, Gerry Cinnamon Embrace, Maximo Park. Not to mention, championing a solid grassroots roster of local and national talent, including Manchester’s Pale Waves, Stockport’s Fuzzy Sun and Not Hot Ashes, Critics’ Choice BRIT winner Sam Fender, Ten Tonnes, The Hunna, Sea Girls, Jade Bird, and Maisie Peters. Festival Awards nominated Neighbourhood Weekender brings together an incredible weekend of live music across three stages, from the biggest acts to the best breaking new bands, alongside a hub of local food and drinks, and a unique community feel. and available to buy in person without booking fees at the Warrington Parr Hall Box Office. SJM Ltd is a company registered in England and Wales with Company Number 2686954. At thebestof we go out of our way to champion thebest businesses in each town and city across the UK.